A handicap permit card is a type of permit that is given to people that have a disability that may make it difficult for them to get in or out of their vehicle and/or have issues walking to their intended destinations. The purpose of the card is to provide benefits to them that would make their lives easier when visiting public places. These cards give a person with a handicap special permissions that may be unauthorized without a card. Depending on the specific type of card that you have, there are benefits that you and your traveling companions can take advantage of. Since these benefits are different depending on the card type that you have, let’s go over some of the basic permits for handicap parking. Renewable, Temporary, Temporary Duplicate (travel), Family, or Foreign Disabled Parking Permits – This card is given out for standard disabilities that don’t give too much restraint on a person’s ability to get in and out of a vehicle and are temporary, but may still need it in certain circumstances. The first benefit is that card holders can park in any spot that is reserved for disabled people, offering more room and a closer spot to the building that you are parking at. Secondly, users can benefit from being able to park in public parking zones for longer than the time allotted for most people. Program Permits – This is the next step up from the last permit, and it is given out to those that have a permanent disability that is a bit more severe. The first benefit is the standard of allowing card holders to park in specially reserved spots. Secondly, they can use meter parking areas for up to three hours, which is more than what is typically allotted. Finally, they can also park in public areas for up to three hours, which is once again, longer than typical. Wheelchair User Permits – This is the highest form of a parking permit. It shares all the same benefits of the last parking permit, but it also allows people to park in public and meter areas without having to pay the fine. This saves them money for parking in these zones. These permits are only given out to people that are handicapped so severe that they use a wheelchair. Where To Hold Your Parking Permit? It is required by law that you put your permit in the visor or hung on the rear view mirror so that law enforcement can view it. The registration and expiration date must be visible to someone outside looking in. If it isn’t here, you may need to go to court to appeal a parking ticket so that you don’t get fined. Place the handicap permit in those locations when the car is parked. When the vehicle is moving such objects may block your view or become a distraction to your driving. You can use a handicap permit visor display or placard hook hanger to make it easy for law enforcement officers to see your permit. They keep your permit in a handy little holder that will secure it in position to make sure that it doesn’t fall down, which could cause you problems. They are very inexpensive and are worth the small cost. If you can afford to put out a little money, it is highly recommended that you use one. 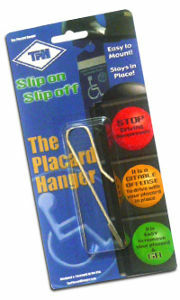 Handicap Placard Hanger Hook – Hang on rear view mirror after you park. Handicap Permit Visor – Place on your visor and flip down when needed. Additionally, remember to keep your handicap placard/permit from expiring, up to date and valid. The Americans with Disabilities Act requires business to provide facilities that enable people with disabilities to enter and exit. It also requires that business make reasonable accommodations for people who suffer from a disability. The same act requires business to provide special spaces near the front of the store designated for use by handicapped parking. Of all the changes a business might have to make to comply with this requirement, providing handicapped parking spaces is one of the easiest. In general, car parking spaces shall be a minimum of 96 inches wide (8 ft) minimum and van parking spaces should be 132 inches (11 ft) wide minimum. Width areas should be marked with a sufficient sized adjacent access aisle. Van parking spaces can be 96 inches wide minimum if the access aisle is a minimum of 96 inches wide. A store or place of business must provide enough space so that a handicap vehicle parked in one of these spaces can use a lift to raise and lower a person in a wheel chair. Depending on the nature of the business’s parking lot, a business may not have to set aside additional room in the parking space for this. Providing parking spaces for people with limited mobility sends a message that the business is friendly to all potential customers. While providing handicapped parking spaces will not increase the volume a business does significantly, installing these spaces may prevent a store from losing the business of people who take up the causes of individuals with disabilities. All parking lots require maintenance. Handicapped parking spaces require slightly more maintenance than the spaces in the rest of the parking lots in most businesses, but this is because they must be painted and marked as special spaces. The law also requires that business putting up signs explaining the fine for using the spaces without a proper disability parking permit. The signs last for a long time, but paint wears out at the normal rate, especially in areas of the country that experience extreme weather conditions of seasonal changes in temperature. Much of the above information applies to stores that have a parking lot. Owners of store fronts in small towns may not be able to provide special parking spaces because it goes beyond the store’s financial capabilities. They still must provide easy access for customers with disabilities, but they will not get a fine if they do not set aside space in front of their stores. In many cases, the parking spaces are provided by the local community. The town has the responsibility for providing spaces in this case.